Olympiad package: Best suited for students in grades 1 to 7 to improve math abilities and/or prepare for Math Olympiad, MathCounts or other math competitions. GT package: Best suited for students in grades 1 to 3 to sharpen cognitive abilities and creative thinking in preparation for an advanced academic program (e.g. gifted and talented). SHSAT package: Best for preparing admission test (math) for specialized high school. SAT package: Best for preparing college admission SAT math exam. Why do both parents and teachers like MathToSuccess? It boosts math and creative thinking skills with dynamic, challenging questions. It's an effective way to attract children to utilize their spare time. Twenty minutes a day will make a big difference. It saves parents both time and money. MathToSuccess is like having a tutor at home but with minimal expense. It's easy for parents/teachers to track the progress of their student with a free parent account. Fun (and money saving!) referral program Tell A Friend. What do I do if I am unable to receive the registration email from MathToSuccess? You may have to wait around 10 minutes and check if the email somehow went into your junk email folder. Make sure that you add mts@mathtosuccess.org to your email account contacts to prevent MathToSuccess email from being automatically delivered to your junk mail folder. The key factors to math success are practice and interest. MathToSuccess is built based on these principles. Each student is given abundant opportunities to practice math at his/her own pace and with his/her unique set of problems. The system also provides opportunities for students to compete with others in the same grade. The backend of MathToSuccess has a set of intelligent programs that track the progress of each student and generates questions with the proper level of difficulty for each student. There are also functions to automatically save questions, evaluate questions, and generate hints and explanations. The system will keep adding new functions and updating current functions as it evolves and improves. How can a student take a practice? 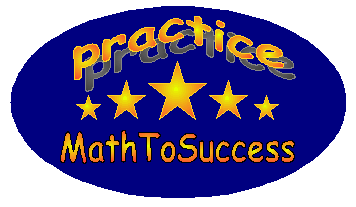 When a student is enrolled in MathToSuccess, she/he will be able to start taking practices right away. Students should prepare a pencil and scrap paper when working on problems. Each practice has a set of questions and a recommended time limit (the practice is timed, but the timing is not enforced). The time remaining will be displayed on the upper right-hand corner of the panel. If a student wishes to take more time to work on the questions, she/he can do so by simply choosing to ignore the timer with no penalty. The system will automatically save answers every couple of minutes or whenever you can click the save button. When you click the submit button, the answers will be finalized and saved to the system. The questions will be evaluated instantly and results will be returned with correct answers and/or hints/explanations. How can a student take a test or compete in a contest? When a student is enrolled into MathToSuccess, she/he will be able to start taking tests or competing in contests. Each test/contest has a certain number of questions and has to be finished within a specified time. The time remaining will be shown in the upper right-hand corner of the panel. The system will automatically save answers every couple of minutes or you can click the save button to save your work anytime. When you click the submit button, the answers will be finalized and saved to the system. The test/contest will be evaluated instantly and results will be returned with correct answers and/or hints/explanations. The scaled percentage for a test/contest will be calculated at the end of the week. What if my network dropped during test or practice? You can always login again to continue the test or practice by clicking the menu that you were working on. However, the time elapsed will be counted to the total time being used, and you may lose some of the unsaved answers. It is always a good idea to write down the answers on your scrap paper. You make payment through the reliable and secure Amazon Payment service or Paypal Payment service. Within seconds of payment, you will be able to use the programs of your selected package in MathToSuccess Systems. Can I cancel my membership and get refunded? If you use the system for less than a month, one month regular fee will be deduced plus a $10 processing fee. If you use the system for more than a month, but less than a quarter, one quarter regular fee will be deduced plus a $10 processing fee. If you use the system for more than a quarter, but less than half a year, one half-year regular fee will be deduced plus a $10 processing fee. No refund for any purchased booklet. Click on the Feedback link to report any issue with the system. How does the "Tell a friend" work? "Tell a friend" is a program that lets more people to know about MathToSuccess with your help. Once you type an email and name, click on "Tell", we will send an email to your friend. If your friend signs on to our service, you will be rewarded based on your account type. Please allow 30 days of processing time for any reward check or card after the request was made. We recommend Google Chrome as it supports "Text to Speech", which may help young kids. IE/Edge, Firefox, Safari are also supported. Please set your browser text size to medium and your display to 1024×768 pixels for best presentation. If you see apparent display issue, please first check if the browser is compatible with our application. Then clear the browser cache and reload the page to see if it resolves the issue. Contact us if the issue persists. How long will be the finished practices and contests be kept in the archive? All finished quizzes, practices, and contests will be kept for 4 weeks during a valid subscription period. What is the "Parent Account" for? The "Parent Account" provides a convenient way to track the progress of your child. How do I report an issue about a question? When you finish a practice or contest, you can click the question number inside the [nnn] of any question to report any issue with the question. How do I contact MathToSuccess Systems? MathToSuccess Systems is created by community volunteers, parents and teachers with expertise in math education and various admission tests. We currently do not have a staff dedicated to phone service. To contact us, please use the emails provided in the contact page. When should I set Disable Timer to true? The timer is enabled by default for each user. A test with timer enabled (such as MHAST/SAT full tests) will be forced to submit upon reaching the time limit. If a student don't want his tests to be forced to submit, then the "Disable Timer should be set to true in the My Info page. How to access the bought booklets? You can access booklets either from My Archive or from Printable Booklet (Login needed). Any booklet will be deleted from the archive after a month of its purchase! Does a coupon code apply discount to booklets?